The flat film wide screen is 1.85:1, HD video (16x9) is 1.77:1. 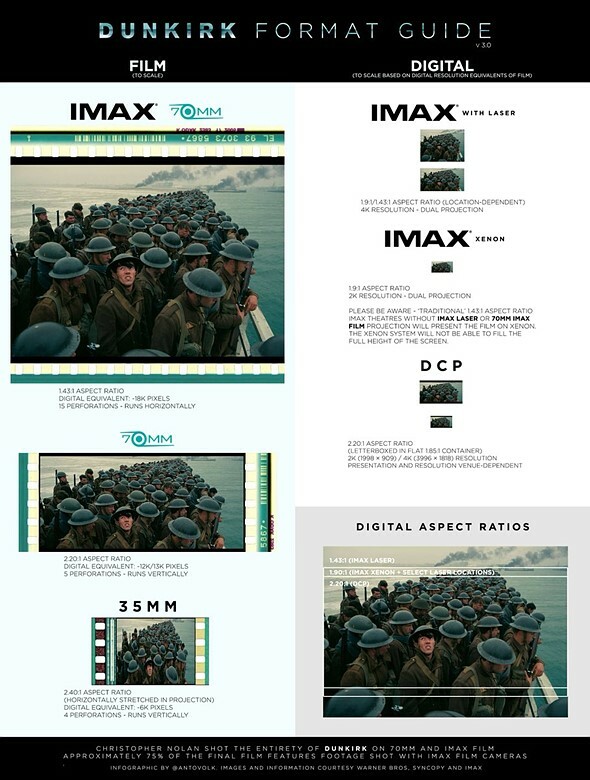 If you want your film to be seen by the most people at theaters and streaming (Netflix, Amazon Prime) don't go with Anamorphic wide screen or Imax. The price to see a movie at an Imax Theater is out of reach for many people. Please don't turn movies into an elitist pastime. Hi eazizisaid. Los Angeles, Ca. suburbs, Imax is $20.00 and up, for an 8:pm showing. The article says the decision to shoot with film has "had unexpected benefits" but when I followed the link, the "unexpected benefits" seemed to be the ability to save the sunken film from the sea through an old technique of keeping it wet until developed. In the link Christopher Nolan said "Try doing that with a digital camera!" But DPReview has published numerous accounts of digital camera cards being retrieved from various bodies of water with the images intact, some submerged for many months, without having to resort to any workarounds whatsoever, so the way the film had to be babied just to get it to survive doesn't seem like a "benefit." What it sounds like was Nolan was happy about being able to save film with a clever workaround, without recognizing that the problem probably wouldn't have been a problem at all, if the footage had been shot on a digital camera card. Those SD card stories crossed my mind. Not sure the same is true for SSDs. Good point. I'm not sure if SSDs would survive as well either, and I suppose they're probably more likely to be used with a cinema camera. SSD have more componentes over a larger PCB, so more exposed parts... OTOH many don't get too hot and could be reasonably sealed, many also have caps that could power them and allow them to store the last few seconds of footage even as the camera falters... No clue how well film keeps working as it's soaked. "No clue how well film keeps working as it's soaked"
What works in favor of film here is that it's probably going to be OK as long as it is not exposed to light or any chemical that would alter the latent image on the dyes or silver. Water itself won't. I'm not sure how salt water differs, but it sure didn't hurt it here. That's why we have multiple stories just this year of used cameras being found with undeveloped film dating from the 1980s to the 1920s where images could still be developed and seen. Apt as Nolan also attended UCL! 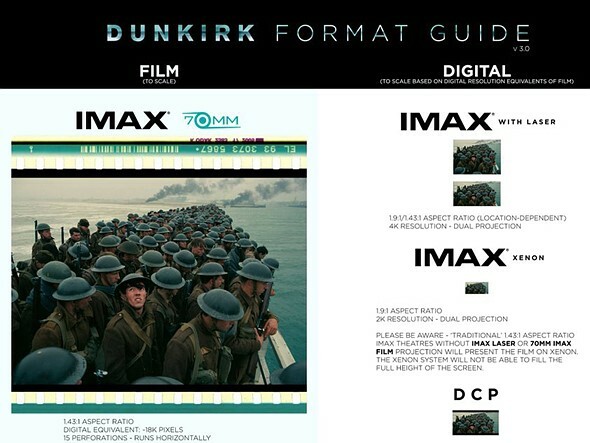 I think the technical details are fascinating, particularly for filmmakers, but I think I would enjoy the film based on the merits of the story/pacing/acting/cinematography. I looked at the sample video with the various crops and aspect ratios and I doubt that one viewing would give me a wildly different impression than another on a different crop or ratio. IMAX is certainly impressive, but I don't need that to appreciate the less technical merits of the film. That said, I tend to prefer the wider ratios in those artsy shots with subject on thirds staring into dead space in the rest of the frame. What happened to letter boxing. Let me see the full image and I will scale it approximately to the monitor or TV I am viewing it on. Ain't rocket science. What i was thinking, when i watch old 4:3 tv shows i just have some black bits at the side. its fine. The record cellphone video vertically crowd would disagree with you. HAHA i hate when they film that way its so funny. Landscape dam it!!!! Chances are I'll never see the movie, period. These staged/battle/action scenes in war movies are so phony and monotonous, and they really grate on me. I guess your average Joe moviegoer laps it up so movie guys don't challenge themselves to make better. There are more interesting and creative ways to depict battle. Because war is fun and always a very original thing. Dee,,, why waste the keystrokes? How's about you shoot your mouth off after you actually see the movie,, otherwise,, zip it. In an article I read, the director has been to very great lengths to represent what it may have actually felt like to be stuck on these particular beaches at the time. This was filmed on the original beaches and there is no CGI. The director also crossed the channel in one of the original "little ships" which was involved in the evacuation. Hmm . . So Dee you'll only accept ACTUAL battle footage before you'll see a film? Never been in battle, but there seems to be a lot of movies that seem to get it pretty darned close to the real thing according to those that have endured it first hand. I will grant you that there are a ton of movies that aren't close to realistic battle scenes, but certainly not all of them. @jhinkey - there's nothing that captures real battle but actually being there. Directed movies are simply a joke. @Juck - I've seen the trailers: boring, cliche battle scenes. CGI or not, it looks stupid. Why should I waste my money? I'll leave that up to you. There are better ways to infer action and battles...thousands of extras not required. Thoughtful people know. This is a serious film attempting to put on screen a very important and often misrepresented moment in history. It was not made for the purposes of light entertainment. It is best thought of as a docu-drama . Certainly not a joke. Sad. So an artist can't make a film that captures the imagery? So throw all cameras away, they are all a joke. @rialcnis - yes, I believe documentary photography is three levels above selfies, artistic/doctored landscape/glamour photography. @PedroMZ Nolan is a fine mainstream director. I wouldn't call him a genius- some of his movies are garbage (inception), and some are better (interstellar). That said, it's still mainstream pop. Serious, he isn't. @Bombastic Ugh Movies today are mostly pop junk, but there are handfuls of artists and technical geniuses, directors following in the footsteps of Kubrick, David Lean, William Wyler, Kurasawa and some others. Nolan is one of the handful. That he is a film vs digital purist as a few are, puts him in rare breed category. Most documentaries today are spinning political ideolgies and half truths, as their reason to exist, little better then Reality TV where art has nothing to do with it, either selling toothpaste or ideology or both. Time Magazine just had a pretty long article on the film and interview with Nolan. If anything, it's good to see film being taken seriously. @rialcnis - he's a master in visuals, and subpar in script. "Dunkirk" reconfirms this. I would not even mention him in the same sentence as the "rest of the gang". As for documentaries-- I'll take half a truth over pure fantasy any day. @Bombastic have you seen the film? Half truths must be your thing. I have seen Dunkirk yesterday at the local 2K IMAX. Lots of visual candy, weak script, crappy soundtrack. Typical Nolan. This is a guide to finding an IMAX theatre. The best of the IMAX theatres in Toronto is touted as being the one at the Scotiabank Theatre, 259 Richmond Street West. DUNKIRK is playing there now. I think it's important to note that the choice to move to digital projectors is shaped by the movie studios and not the cinemas themselves. Many films are not distributed on film at all so if you do not have a digital projector, you are missing out. I know a smaller cinema that had to replace their old projector with a digital one to be able to show The Hobbit. That "squeezing" was once referred to as Cinemascope (widescreen). It was very common for the bigger production films starting in the 1950's. The rest were called "flat" lens movies. Then by the late 1980's pretty much every film was in widescreen. A great example of how framing is in fact the real art of photography, and indeed cinema photography. Went out of my way to buy tickets to see it in 70mm IMAX in Philly tonight. Can't wait. Christopher Nolan hasn't let me down once yet. Franklin Institute, right? I saw The Dark Knight there nearly 9 years ago to the day. The IMAX 70mm scenes in that movie were stunning.